The Rev. Dr. David Buegler has been part of St. Paul Lutheran Church and School for 30 years. Buegler, 72, had served as the interim principal of Westlake’s oldest independent preparatory school since January, following the resignation of former Principal Dale Lehrke. 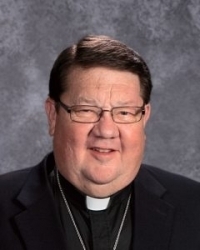 He also served the St. Paul flock as associate pastor for more than 20 years. For many there, he is St. Paul. Buegler stepped down as the school’s interim principal on July 2 with the arrival of new administrator Jeremy Louden from Houston, Texas. For the fourth time, he’s giving retirement a try. Buegler boasts an impressive resume filled with both national and international synodical work. He admits he’s much more comfortable speaking in front of 10,000 people than before a small group of individuals. As the former executive director of both Lutheran East and Lutheran West high schools, Ohio District President and the fifth Vice President of the Lutheran Church-Missouri Synod, his work has taken him all over the world. But he’s most at home at St. Paul Westlake. Buegler says that being a school principal today is a tough job. In addition to his interim principal duties, Buegler continued his regular duties as pastor emeritus. “Preaching, teaching, weddings, funerals, some pastoral care work and lots of meetings has created quite a schedule,” he said. With Louden’s arrival, he looks forward to a much less hectic life. He and his wife, Susan, will celebrate their 50th wedding anniversary this summer. They both love to travel, and will be taking a Caribbean cruise to celebrate. It’s the one way he really relaxes. Despite all his success, Buegler is a self-admitted introvert. That’s a fact he says will surprise most people who meet him. “I’ve learned that there is a necessity for people skills to make the church relational and attractive. But there are times when I’m quite content to be alone,” he said. Buegler served on the board of trustees of the Fairview/Lutheran Hospital division of the Cleveland Clinic from 1995-2012. He currently serves as a director of the Community West Foundation board, and continues to be a frequent motivational speaker throughout the church.